Insulating a Wooden Summerhouse or Log Cabin – How Important is it? If you want to spend time in your wooden summerhouse or log cabin all year round, you’ll need to make sure it’s a homely place to be. That doesn’t just mean kitting out your garden-based getaway with comfy chairs, cushions and throws either. Ensuring that your summerhouse or cabin is just the right temperature inside is a must, so that you’re not shivering in winter or melting when the sun comes out. Installing insulation can help you to do this – just read on to find out more. Do Log Cabins Need Insulation and, If So, Why? There’s no legal requirement for you to insulate your log cabin or wooden summerhouse, but it’s a practical and cost-efficient thing to do. Whether you’re planning to use your new living space as a home office, art studio, home gym, or just somewhere to escape from the daily demands of family life, it’s important to make sure it’s suitable for use in every season. If you have electricity installed in your log cabin or wooden summerhouse, you can use standalone heaters and fans to keep it at your ideal temperature. You can even have built-in heating and cooling systems fitted. However, no matter which way you choose to heat and cool your garden room, installing insulation will help you to keep your energy use to a minimum. Once insulation has been fitted, your log cabin or wooden summerhouse will retain more warmth in the winter months, keeping it cosy inside even when it’s chilly outdoors. When the mercury soars, however, the insulation will help to keep your garden room cooler, so you can work or relax in comfort. That means that, despite the extremes of the British weather, you won’t need to use heaters or fans so often, helping you to keep your electricity bills low. 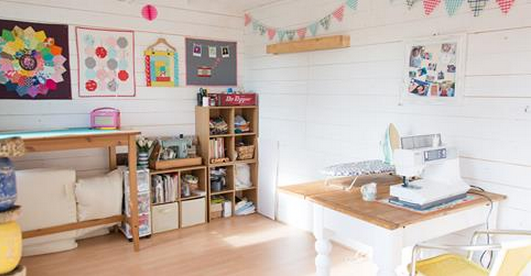 Insulating a wooden summerhouse or log cabin will enable you to make the most out of it. You and your family will be able to snuggle up in your garden-based haven in autumn and winter, and relax in it with a cool drink while enjoying close-up views of your garden in spring and summer. What’s more, insulated log cabins and wooden summerhouses are more environmentally friendly than their non-insulated alternatives. Installing insulation is the ideal option for eco-conscious garden building owners who want to work or unwind in comfort, but without dramatically increasing their carbon footprint. Most of the wooden summerhouses and log cabins in our extensive range have insulated cavity walls, as well as double glazing. However, when you buy a garden building from Creative Living Cabins, you can also choose to have floor and/or roof insulation installed. 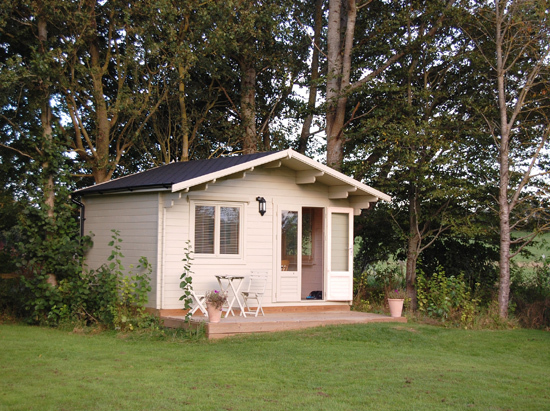 It’s also something worth considering if you’re opting for one of our bespoke cabins or summerhouses. 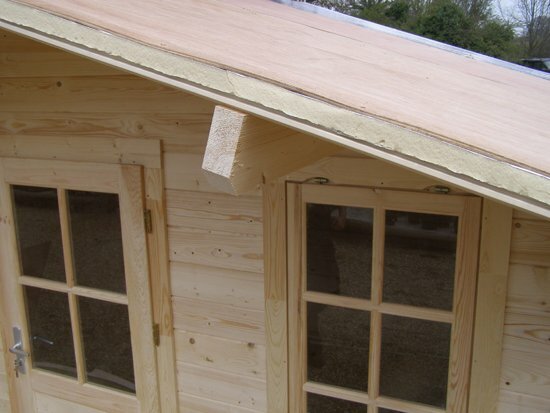 When insulating a wooden summerhouse or log cabin, we use 25mm insulation boards, which are manufactured by Celotex, one of the best-known brands in the insulation business. These boards are made from polyisocyanurate (PIR). PIR insulation boards are extremely thermally efficient, and are also durable, moisture-resistant, and fire-resistant. We fit these foil-lined insulation boards between the roof boards and an external layer of plywood, and between the bearers before the flooring, so they won’t be visible or take up too much space. 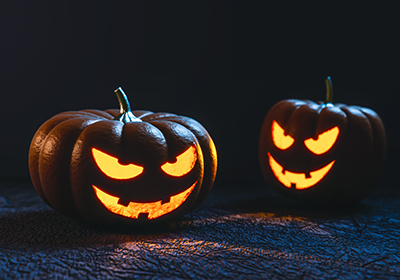 When you switch your heating on, the thermal insulation boards will help to keep that warmth within the building, so you won’t be wasting heat – or spending your hard-earned cash on energy unnecessarily. The foil lining, on the other hand, will reflect the heat of the sun to prevent your garden room from getting too hot at the height of summer. When you buy a log cabin or summerhouse from us, we can install roof or floor insulation for an extremely reasonable price. We also offer a wide range of other optional features, including air conditioning and heating systems, and electrical packages. You can see some more about our insulation here. To find out more about our high-quality garden buildings, and the insulation options available to you, explore our website, give us a call on 0800 644 6442, or make an appointment to visit one of our display villages. Once they’re gone, they’re gone…. Was your household bursting at the seams this Christmas? If you, like me, were keen for an extra space to curl up in with a book, then Creative Living have many different outside buildings ranging from summerhouses, to garden offices to well, simply, just a bolt hole. If that sounds like a good option for you then please see our full range of log cabins and garden office buildings for which one would be best for you. Alternatively, why not come by to one of our 3 showrooms based at garden centres in Surrey and near London. You can see from all our customer feedback that by choosing Creative Living Cabins you will get yourself a quality new room outside, fitted by professionals, so that for next Christmas you will have that perfect bolt hole ready and waiting. We love to receive letters and emails from our customers about how happy they are with their new log cabins or outside building and how happy they have been with our service. We take pride in offering excellent customer service from enquiry to installation, so it is good to have that confirmed by your comments. To read the full letter of recommendation above along with the others we have posted on our website then please click Log Cabin Customers. London garden buildings add value in a booming market. We are all aware that property values in London are rising faster than across the rest of the country with a 19.1% year on year increase. The average property price in London has now reached an incredible £514,000, according to an article in the Guardian (16/9/14). Despite some reports of the increases cooling slightly if we are lucky enough to own our own homes then we sure need to enhance and make the most of every inch of the home and garden. A quality garden building adds value to a London home. You can’t turn on the TV in the evenings without seeing an interior design or building programme that shows you how, with a little creativity, you can use a timber building as a spare room or as an extension to the house to give you the space that you badly need. One of my favourite programmes is ‘George Clarke’s Amazing Spaces’ where each week the presenter George Clarke shows you some inspirational outside buildings where people have created their own innovative spaces. Creative Living Log Cabins have three display villages to the South of London, where you can go to get a feel for how you could have a new outside space for your home. With a number of models of log cabins and outside buildings we can show you how you could very easily have a quality new space for sewing, a snooker table, gym, home office or maybe just as a spare room. Contact us today for a free survey. 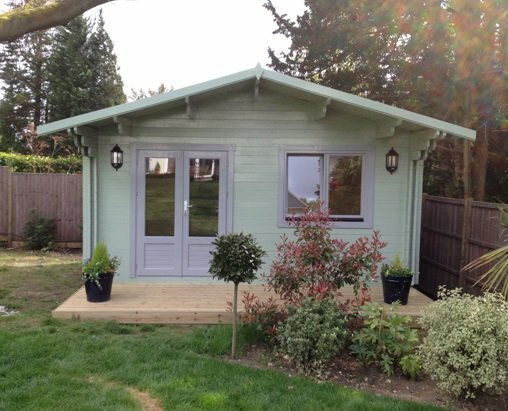 The Hampshire Log Cabin comes in many sizes, so whether you are looking for a beautiful summer house to nestle at the bottom of your garden or a home office, games room or extended living the uses for this cabin are endless. Leading out from the double width glass patio doors, is a veranda and overhanging roof provide the perfect place to sit out in the Summer months or shelter from the elements in the Winter. The double width doors not only let in plenty of light but give our customers a great view of their surroundings– so whether you’re sitting at your desk looking outside for inspiration, or looking onto your gardens or swimming pool – the Hampshire cabin is a great way to let the outside in to your new garden building. Great prices on our garden home offices. Garden home offices can be a great solution and offer exceptional value for money. Your own garden space from Creative Living will be bespoke. Our installation team will build it, quickly, efficiently and within planning guidelines. Your garden office will be built to meet your individual requirements giving you you the extra space you need to get on with the things you need to away from distractions. Built to the highest spec from Siberian Spruce with a cavity wall for an even temperature throughout the year, we can advise you on your garden home office roofing, heating, and electrics. Within easy reach of Berkshire, Hampshire, West Sussex and London why not call in at any of 3 display villages and have a chat with one of our friendly sales team. They will be happy to give you information and prices, plus any help or advice you may want. LBC 97.3FM is London’s Biggest Conversation, which accompanies Londoners through their daily life. It’s an entertaining, engrossing and intelligent conversation between the presenters and the listeners, covering the thoughts and topics that Londoners are really talking about. Our diverse presenters, including Nick Ferrari, James O’Brien, Steve Allen and Clive Bull, each bring their own unique and entertaining edge to London’s only commercial speech radio. LBC 97.3FM is available on 97.3FM, Sky Digital, Virgin Media and on your mobile. LBC News is available on 1152AM. We get a lot of positive feedback about our log cabins from our customers, and a particularly nice testimonial has come in from Peter Smith of Kingston. ” Our Cabin is first Class quality. With double skinned walls with insulation, it feels like a real House, not just a garden cabin. The installation team were professional, knowledgeable and diligent. Also, an excellent electrician – very flexible and very reasonable pricing for extras. We decided to buy from Creative Living Cabins because they offered full management from end to end. We didn’t have to worry about delivery, getting the kit to the end of the garden all the way through to the expert electrical work and correct wood stain. I would unconditionally recommend Creative Living Cabins to anyone who is considering a garden office – the package from the free site visit through the planning and work by the highly professional installation team and electricians is extremely good value. The small extra cost of having the cabin constructed is worth every penny. The team at the office were equally professional and a pleasure to do business with. We do appreciate customers feedback, good bad or indifferent, as it helps us to improve our business. But we do like the good ones better!